Neymar scored one goal and set up two more as Brazil turned on the style with a 5-0 thrashing of Bolivia in South America’s 2018 World Cup qualifying competition on Thursday. Barcelona superstar Neymar’s 49th international goal in his 73rd appearance took him one clear of Zico on Brazil’s all-time topscorer’s list. Still only 24, Neymar should reach Pele’s all-time record of 77 goals from 91 games with something to spare if he continues to score at his present rate. The Brazilian talisman was eventually substituted midway through the second half at the Estadio das Dunas in Natal, leaving the field to a loud ovation for his role in another impressive Brazilian win. Brazil’s victory left them comfortably on course to secure their place at the 2018 finals in Russia. The Brazilians are now second in the standings with 18 points from nine games. It was also a third consecutive victory from three games for new manager Tite, who was appointed after the sacking of Dunga in June. A sparkling first half performance effectively secured the points for Brazil, with Neymar, Philippe Coutinho, Filipe Luis and Gabriel Jesus all finding the net to put the hosts 4-0 up at half-time. Coutinho’s Liverpool team-mate Roberto Firmino made it 5-0 with a 75th-minute header. Neymar fired Brazil into the lead on 10 minutes, working a wonderful one-two with Manchester City teenager Gabriel to slice open the Bolivian defence before tapping into an empty net. Coutinho doubled the Brazilian lead on 25 minutes after another superb passing move, with Dani Alves and Giuliano combining down the right to set up the Liverpool playmaker for a close-range finish. Neymar then set up Brazil’s third with a surging run that drew four Bolivian defenders before he threaded a pass through to Luis who drilled home his shot from just inside the penalty area. Gabriel then put the seal on a mesmerising opening 45 minutes with Brazil’s fourth goal. Once again, Neymar was the architect, bursting clear as Brazil broke out of defence swiftly before picking out Gabriel who lifted a delicate chip above the on-rushing Bolivia goalkeeper Carlos Lampe. 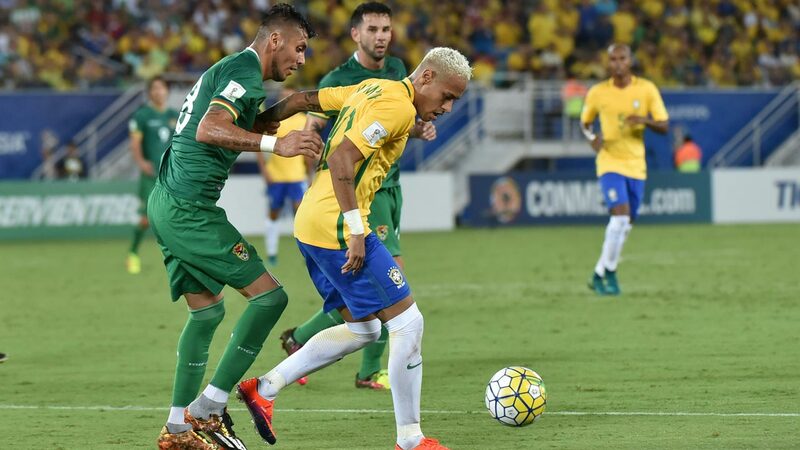 Brazil face a trip to winless Venezuela in their qualifier on Tuesday.